I've been meaning to create this blog post since June, so shame on me. A couple months ago, April was the last to join the rest of us best friends into the Dirty 30 age decade. To celebrate, we decided to begin the day over at a place called ARTS N SPIRITS. Another one of the BFFs, Katie, had stumbled across this joint, and thought it would be perfect for April's birthday. Katie and April both have a talent for artwork, I am decent with a pencil, but am disabled with a paintbrush, and Cat, the last 25% of our quad, is scholar, but doesn't fancy herself an artist. So, a few different backgrounds when it comes to the arts. But, a gift with the arts is not necessary to have a good time. You, see LIQUOR is involved! 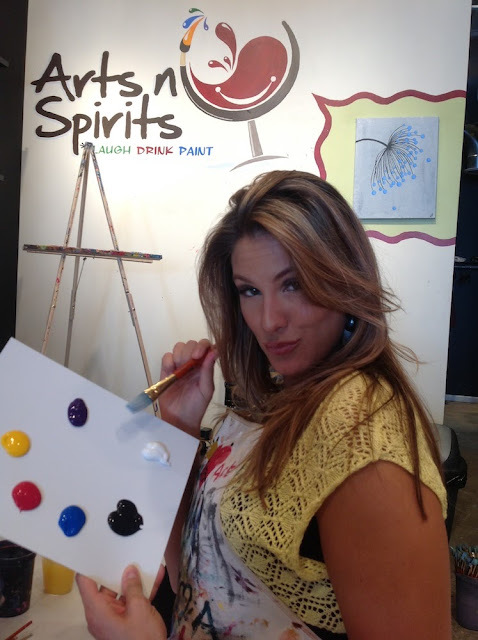 Arts n Spirits is a BYOB venture, and its slogan, "Laugh Drink Paint," is completely appropriate and true. 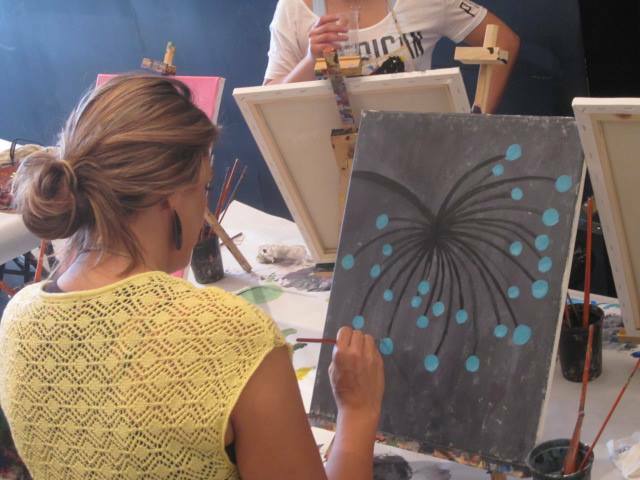 They hold classes 6 days a week (no Mondays), and have all the supplies that you will need to generate your masterpiece. Reservations are made by phone or web, and they have a calendar on their website (http://www.artsnspirits.com/calendar.php), where you can choose either a time/day for your schedule, or you can choose a class based on the painting that you would like to recreate. They also have days set aside for "Open Art," where you can walk in and paint whatever you'd like. We booked ourselves for one of their "Mimosa Mornings," where they supply the OJ and we bring the sham-pog-nay. The painting for this particular Saturday morning session was "Wish Flower:"
Our instructor set a good pace for the class, and it was very easy to follow along with the colors, different brushes, and techniques. It is not necessary to commit to the colors on the model; you are free to let your artistic side flow. There were periods where the paint had to dry, so there was time to refill drinks, and simply hang out. 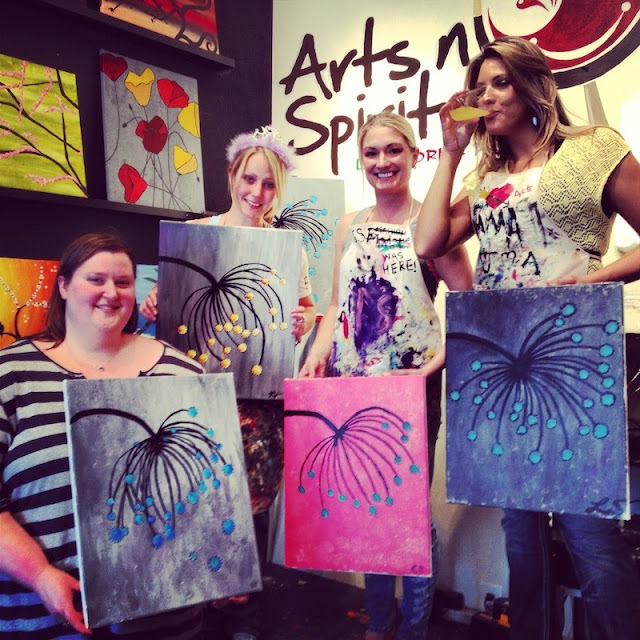 We had a blast, and I wanted to share this with you, because it is fun and a different way to enjoy cocktails (of course, you don't HAVE to drink), and also try your hand at painting. I swear, the last time I picked up a paintbrush... had to be in some class in high school. It was fun to do that again, even though I am not good at it. I enjoyed making the colors, and using a bit of Tim Burton to inspire my look. Duckface and getting ready to paint. Attempting to paint "Wish Flower." Kate, April, Cat, and me with our finished products. When we got back to Cat's place, we arranged them on her shelf. Hooray!